Capitalizing on Seattle's borrowed Indian heritage, city leaders cranked up the marketing machine to promote their version of Progress. Local boosters called themselves "Tillikums," the Indian word for friends, and led a number of civic celebrations. 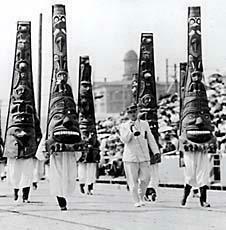 At left, the Tillikums carry giant papier maché totem poles in the 1912 Potlatch parade down Second Avenue. Photo Credit: Special Collections, UW Libraries. THE "SEATTLE SPIRIT" BECAME THE CITY'S MARKETING SLOGAN in the new century. The phrase became the touchstone of every political speech, the staple of civic pride, the local rallying cry. Politicians, boosters, historians, journalists -- the phrase seemed to be on everyone's lips. Remember 1872, they asked, when the Northern Pacific bypassed Seattle? Every man in town contributed a day of labor each week to build the city's own railroad. Remember 1889, when the great fire consumed downtown? Six hundred businessmen gathered in the ashes, vowing to rebuild in towers of brick and stone. Old-timers who lived through the crises of 1872 and 1889 remembered the original Seattle Spirit as cheerful pluck and hard work in the face of disaster. In 1880, Seattle's rivals had been Mukilteo and Tacoma; after 1900, they were Portland and Los Angeles. Once, Seattle had simply prayed for a lucky break; after 1900, city powers plotted strategy to sustain the city's prosperity, and remind the world that Seattle's opportunities didn't end with the Gold Rush. Seattle businessmen don enormous cat heads to pull a brightly decorated float past the old Seattle Times building, at the corner of Second Avenue and Union Street. Photo Credit: Seattle Times. IN THE NEW CENTURY, BOOSTERS JOINED THE OLD CIVIC DETERMINATION with a brazen new commercialism, and the Seattle Spirit was reborn as unquestioning enthusiasm for development. Boosters published the book "The Seattle Spirit" in 1907. The city's Progress magazine devoted an entire 1910 issue to the Spirit. And scarcely a week passed that The Times didn't devote an editorial to the Spirit, or a feature to "The Men Behind the Seattle Spirit" or "The Business Houses That Are the Seattle Spirit." The newspaper even published a lengthy series, "Why Seattle is a Young Man's Town," reassuring its readers that native sons and eager newcomers could still make their fortunes in the Pacific Northwest. And the success of the Alaska-Yukon-Pacific Exposition encouraged local boosters to plan another ambitious event to showcase the city. The Seattle Chamber of Commerce, the Advertising Club and the Press Club decided to create a civic celebration loosely modeled on the Northwest coastal Indian tribes' potlatch, a ceremony of friendship and sharing. Seattle held its first Potlatch in 1911, but the Golden Potlatch of 1912 was a far greater festival, meant to attract visitors from far and near. Its president, Times business manager Joseph Blethen, said the 1912 Potlatch was "the Seattle Spirit embodied," but also called it an "advertising stunt." The summer carnival was both a cynical exploitation and a madcap spectacle. The Potlatch shamelessly looted the heritage of Pacific Northwest Indian people. The Golden Potlatch began with the arrival of the "Hyas Tyee" -- or Big Chief -- in his great war canoe, visiting the city from his home in the far north. Pumping up "the Seattle Spirit" to the level of Greek mythology, The Times published this illustration of lightly clad "gods," one contemplating a ship, another digging a ditch and a third consulting a scroll of the city's plans. THE TILLIKUMS OF ELTTAES (SEATTLE SPELLED BACKWARD) paraded the streets in white suits, their hats draped in battery-powered lights, gladhanding any visitors who came their way. Bright-eyed members of the Press and Ad clubs, as well as the Chamber, slathered themselves in greasepaint, donned Chilkat blankets and pretended to be "tyees" and "shamans." But the Golden Potlatch volunteers also offered a week of entertainment free to anyone in the city. 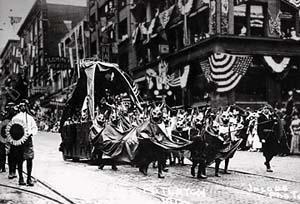 Every day there was a different parade downtown -- of the fraternal orders, the labor unions, the soldiers and sailors, or Seattle's children. Daredevils flew "hydroplanes" over Elliott Bay, and warships from the U.S. Pacific fleet anchored in the harbor. The Arctic and Rainier clubs held open house for all comers; the Chamber prepared packets of information on living and investing in Seattle. Real-estate developers offered free excursions to their building sites, and local industries mounted exhibits. Many businesses ran special promotions in the newspaper, selling "Potlatch" suits or "Potlatch" beer. The Times claimed that 150,000 visitors attended Seattle's Golden Potlatch. It was quite a victory for the newborn game of advertising. In uncritical pursuit of Progress, youthful professionals had created an entire industry by repackaging 19th-century traditions for 20th-century consumers.